Home > July 2015 > C. Dean Metropoulos on the Cover of Forbes Magazine! 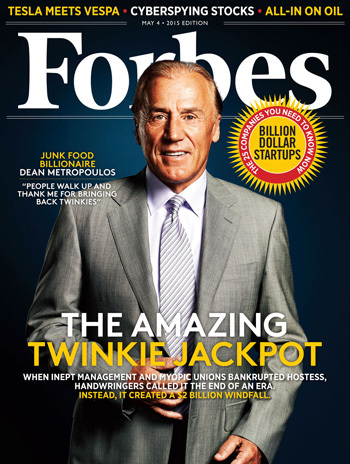 C. Dean Metropoulos on the Cover of Forbes Magazine! C. Dean Metropoulos was featured in Forbes Magazine’s May 4, 2015 edition, appearing on the cover. The article noted his ingenuity, capital and creative chemistry for engineering the rebirth of bankrupt Hostess Brands, and its signature oblong Twinkies cream-filled yellow snack cake. Along with Apollo Global’s Andy Jhawar, Metropoulos was credited for recognizing the brand awareness and ubiquity of the 150-year-old company that had $1 billion in revenue before bankruptcy and turning a $410 million investment for the cake brands division, plus another $250 million to rehabilitate the business, into an expected $2 billion windfall. In being freed from the crushing costs of 36 factories, 5,600 delivery routes, 19,000 jobs and insurmountable pension costs, Hostess was reduced to three state-of-the art automated factories and their business concept made the company “one of the most efficient and effective in the entire food industry,” according to the Forbes article. Metropoulos is credited with turning battered food brands into profitable companies… over 35 years, he has rehabilitated dozens of businesses, including PAM cooking spray, Pabst Blue Ribbon Beer, Bumble Bee Tuna, and Chef Boyardee. Having emigrated with his family from Greece when he was 10 years old, he went on to earn a B.A. and M.B.A. from Babson College and pursued a Ph.D. in International Finance at Columbia University, working at General Telephone & Electronics (later to merge with Bell Atlantic to form Verizon). After traveling worldwide for GTE, he made his first American acquisition, a cheese company, and devoted himself to food brands, teaming up with a private equity firm and forming his own company. His two sons, Evan and Daren, joined him in the family business, and have made their mark with profitable acquisitions and marketing promotions.